I would love to read this book. You are a very strong person. I admire how you are coping with this. My best to you. Sounds like an interesting premise. My husband had NF1 (no, it didn’t even spoil his looks; the cancer seemed completely another thing). I think I always wondered whether NF2 didn’t logically have to exist, but this is the first time I’ve heard of anyone actually having it. Thanks, Priscilla. It is rare but I’m not the only. There are a few facebook groups for people with NF 2. NF1 and NF2 are two different diseases, I’m not sure why they are both called the same since different chromosomes are involved with the 2 diseases. Thanks Pam. I hope so! Stories from our heart are often the best. 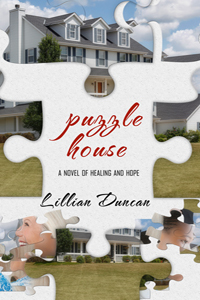 Puzzle House will be no different, I’m sure.